This special issue explores the relationship between literary representation and contemporary, postcolonial capitalism. We suspect that many of today’s “new” capitalist formations emerge from the historical and socio-cultural circumstances of national independence movements and the “age of three worlds” (Samir Amin). We believe that literature offers one avenue for arriving at a fuller account of the role of the postcolonial – in both its historical and political senses – within contemporary global capitalism. Not only is the legibility of postcolonial literature contingent on capitalist networks of circulation, but the content and form of literature have also been historically vital to anti-imperial and anti-capitalist critiques. We are particularly interested in sites that were previously marginalized by colonial-capitalist practices but are now seen as major players in the “Asian Century,” BRICS and “emerging economies,” Trans-Pacific Partnership, or “Belt and Road” narratives. These sites experience postcolonial capitalist phenomena such as the rise of democratic state capitalism, capital accumulation as defense of sovereignty, the independence rhetorics of capitalism as liberation from colonialism, and the cultural capital produced through transfiguring the postcolonial as ethnic, global, and/or world literatures. Rather than treating hypercapitalist developments in these sites as a postcolonial aberrance or as the completion of the colonial project, we seek to account for the historical present through texts that engage sites of economic and literary production outside of the Western hemisphere and the Global North. The postcolonial, we contend, is not always synonymous with the anti- or de-colonial, nor may it be recognizable or palatable to current theoretical frameworks. These historical realities require new understandings of the role of aesthetic forms within the matrix of postcoloniality and its relation to global capitalism. However, this contention raises troubling questions such as: what is the relationship between postcolonial capitalism and the ongoing project of economic and cultural decolonization? What fissures are opened in the nation-state by such capitalist formulations and what are its consequences for the peoples marginalized by indigeneity, race, caste, class, gender, sexuality, or ability? How do literary and critical discourses of postcolonial capitalism comport with intersecting or kindred denominations of globality, such as transnational/global capitalism or neoliberalism? How does postcolonial capitalism function in relation to forms of cultural capitalism, in particular the canonization and increasing institutionalization of postcolonial literatures? Can such struggles ally with international movements given the immediate contradictions of their radical trajectories? How do postcolonial states’ allegedly retrograde or inhumane stances on gender and/or religion factor into programs for economic development? We welcome papers that engage, extend, or depart from these provocations. Please find an extended CFP at https://postcolonialcapitalism.wordpress.com/. Submit 350-word abstracts and brief bios to guest editors Cheryl Naruse (cnaruse1@udayton.edu), Shashi Thandra (shashithandra@gmail.com), and Sunny Xiang (sunny.xiang@yale.edu) by October 1, 2016. Prospective articles of 6000-9000 words will be due on May 1, 2017. The special issue has an anticipated publication date of 2018. Submissions are subject to blind review. 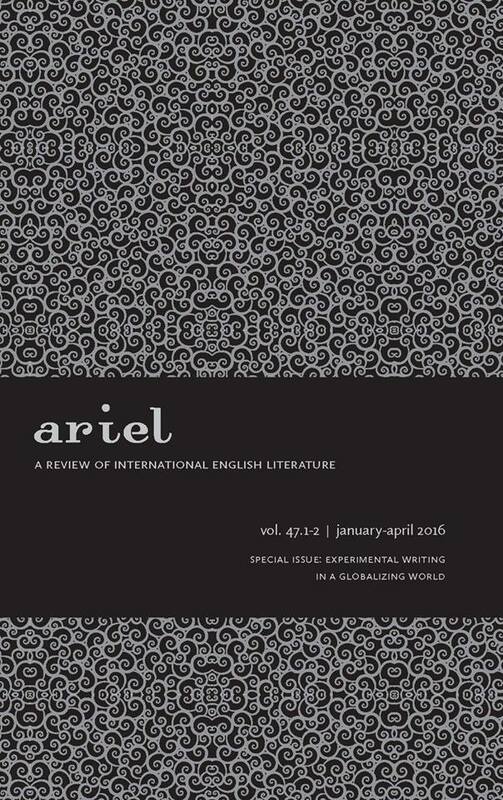 ARIEL: A Review of International English Literature is a quarterly journal (published in January, April, July, and October) devoted to the critical and scholarly study of the new and the established literatures in English around the world in its various manifestations as International English Literature, Postcolonial Literatures, Commonwealth Literature, New Literatures in English, and World Writing in English (see Message from the Editor). It welcomes particularly articles on the relationships among the new literatures and between the new and the established literatures. More info about the journal here.